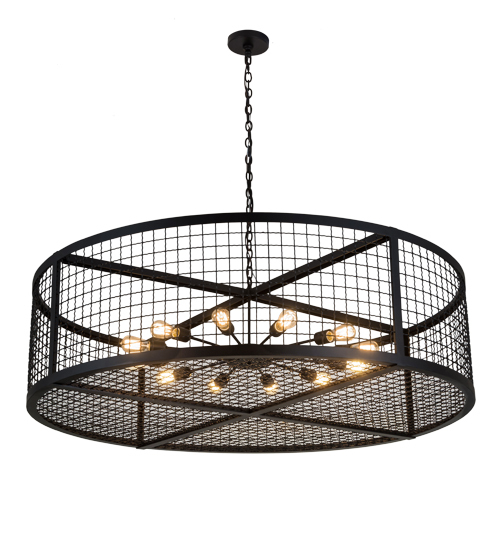 Description: Discover a unique decorative look and industrial lighting design featuring a Grand styled caged frame that reveals a sprocket styled configuration with 12 Customer-supplied, Medium base Edison styled lamps from within. Paloma Golpe offers solid hardware and frame featured in a bold Textured Black finish. The 5-foot wide fixture is ideal for illuminating entryways, lobbies and large residential, hotel, restaurant and other commercial spaces. Handcrafted by highly skilled artisans in the USA, this fixture is offered in a myriad of custom lamping options including LED, as well as sizes, designs and finishes. The striking pendant is UL and cUL listed for damp and dry locations.